On their previous album, Abgelaufen!, Electric Orange went from the two piece duo of keyboardist Dirk Jan Müeller and guitarist Dirk Bittner (both play assorted other instruments as well), to a four piece group. The band remains a four piece on their latest album, but joining the two mainstays this time out are Josef Ahns on guitar and Silvio Franolic on drums. With a full band, they were able to move further away from the duo’s more electronica roots to explore deeper, Krautrock style textures and rhythms. The adventure continues on the all-instrumental Platte, a limited edition vinyl only release. I can’t say I’ve bought a whole lot of vinyl over the past 15 years, so it was a kind of an exciting and nostalgic experience receiving my copy of Platte in the mail, especially with its retro style cover art. When I slapped it on my old turntable and cranked the volume up, I was blown away, feeling like I was a teenager again, getting my first taste of Amon Düül II or Ash Ra Tempel. 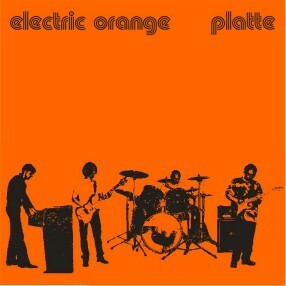 Actually though, while Electric Orange is indeed a German group with definite Krautrock leanings (Abgelaufen! had a marked Can influence in its rhythmic style), Platte reminded me more often of those early, psychedelic, Hammond organ drenched Pink Floyd excursions from albums like Saucerful of Secrets, More, and Umma Gumma, though with definitely more of a groove happening than Floyd tended to get into. Kwark spans the entire 20-minute length of side one of the album, starting off with a slow but mesmerizing rhythm, and subtle flourishes of weirdly echoing guitar. As it builds, Müeller enters with his long, droning chords on the Hammond, producing a hazy, narcotic atmosphere of light filtering through multi-colored curtains into smokey, incense filled rooms. The intensity increases, with Bittner getting more twisted and experimental on his guitar as the drums and bass pound in an ever-deepening groove till the piece finally peaks, drifting off slowly to the same groove as the intensity melts away into some laidback wah-wahed guitar noodlings. What can I say? Kwark is a track that defines the very essence of “trippy”. Side two opens with Holzbock, borrowing from the more upbeat, rhythmic nature of Abgelaufen! But while some of the stuff on Abgelaufen! tended to have a bit of looped feel to it, Holzbock, with its funky organ and snaky, acidic guitar has a much more natural and organic feel. Columb finishes side two off, and is definitely the spaciest track on the album, with oodles of echoey effects applied to deep, plodding drums and distant, cosmic organ. Freaky thuds and reverberations resonate through the dark and twisting soundscape, charging the atmosphere with wild energy, as it builds into an intense and mind bending jam to finish the album off. This is classic psychedelic jamming, played on vintage instruments, with all the analog warmth of vinyl, just like the old days. If that’s what you’ve been missing, you’ll find it all on Platte. Dig in and enjoy...I certainly did!